Colombia’s President Juan Manuel Santos said on Monday he will not recognize the elections in Venezuela on Sunday. In the face of the elections [in Venezuela], we’ve been very clear: we are not going to recognize the result of those elections, because we do not believe that those elections are democratic, nor fair; they are rigged elections, they already have a predicted result, and they seek to perpetuate that regime that is increasingly repressive. 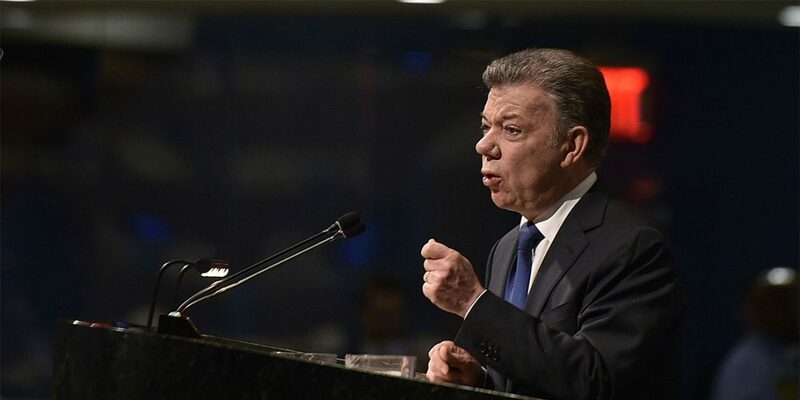 Santos made the announcement in front of 500 diplomats and businessmen, and spoke about the “great effort” Colombia has made “in terms of caring for” Venezuelans who have massively been fleeing their home country. “We will continue to be generous with Venezuelans who arrive in Colombia,” Santos said. Santos also took time to criticize Maduro’s authoritarian administration. “They continue to deny the possibility of countries like Colombia or the international community, or countries like Spain offering humanitarian aid. They say they don’t need it because they don’t have a crisis,” he said. Before arriving in Spain, Santos met with leaders in Hungary, Italy, and Germany this past week and took the opportunity to publicly predict a regime change in Venezuela. “With a regime change, which will come and will come very soon, the Venezuelan economy, with a bit of good governance, will take off very fast and the opportunity for Colombia is huge,” Santos said in Hungary on Friday. Santos did not say how exactly he hopes this change occurs. Maduro was handpicked by the late “Commander” of the revolution, Hugo Chavez. “The revolution is going to record the biggest victory in its entire electoral history,” Maduro boasted last week on Twitter. The official opposition in Venezuela remains fragmented and has boycotted the “fraudulent” elections. “The ‘voting’ in Venezuela on May 20th is being done only to provide a phony cover for a dictator,” the US envoy to the United Nations, Nikki Haley, said last week. The final blow to the Venezuelan economy and government could come from a possible ban by Washington on 500,000 barrels of crude oil the US buys from Venezuela each day. Nonetheless, the Colombian president said he remains hopeful for Venezuela. “If I had to bet, I’d bet on Venezuela in the future. What I am going to say is a very sad irony: it is the richest country in Latin America with the worst performance,” Santos said while meeting with businessmen in Hungary. Some political analysts in Venezuela think the last route to end Maduro’s tenure will come from an internal coup. “I wouldn’t be surprised if there is a coup within Chavismo…He [Maduro] can’t keep running the country like this,” a political analyst in Caracas, Dimitris Pantoulas, told the Financial Times. Nine officers were reportedly arrested in Venezuela in March for allegedly “instigating a rebellion” against the government.